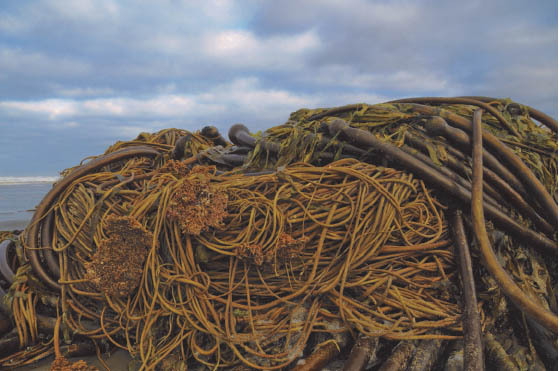 During storms, high winds and violent currents may cause kelp to be ripped up from the sea floor. Strong wave action tangles the kelp, which eventually washes up on the beach in enormous knots. 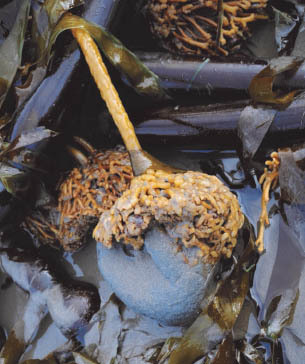 Holdfasts are root-like structures which form at the base of algae (seaweed) to fasten the algae to a hard substrate (such as rocks, reefs, etc...). Holdfasts are different from roots in that they do not absorb nutrients. Holdfasts are an ideal home for many small invertebrates. The inside of the holdfast provides protection from predators and strong ocean currents. Animals you might find inhabiting a holdfast include brittle stars, juvenile cancer and decorator crabs, sea squirts, sea anemones, sea urchins, skeleton shrimp, worms, nudibranchs, sponges, and many more.